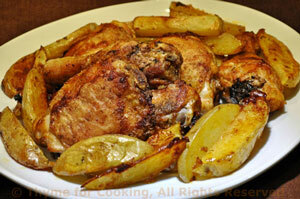 Oven Fried Chicken with Potatoes, Weekly Menu Planner. I love fried chicken but hate doing anything with hot oil. This has the taste and crunchy skin without the mess. It requires a bit longer cooking time but very little hands-on time. This recipe assumes bone-in chicken which has a longer cooking time than boneless. This works well with any cut-up chicken parts. I get the thigh and leg in one piece and cut it, but could be left together. Spread olive oil on a baking sheet with a rim. In a plastic baggie mix the flour and spices. Lay on the baking sheet, skin side down, and bake 425F (220C) for 15 minutes. Cut each potatoes into 8 wedges, the long way. Remove chicken from oven, add potatoes around the chicken and bake for 15 minutes. Remove from oven, turn chicken, potatoes and bake for 15 minutes longer. This is a simple dish. 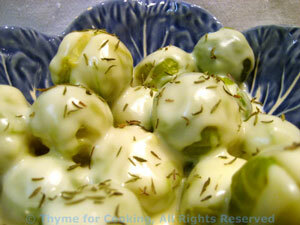 The mustard adds a bit of pleasant sharpness to the sprouts, going well the with mild cabbage flavor. Put them in a small saucepan, add about 1/2" (1.25cm) water, cover and cook over medium heat until just barely tender, about 15 minutes. Check by piercing with a knife - it should go in fairly easily but with a little resistance. Try not to overcook or they tend to get bitter. When done, remove from heat and drain. Put sprouts into a serving bowl and cover with the pan lid. Put the pan back on medium heat and add the mustard, milk, thyme and cornstarch, whisking well. Heat to boiling, whisking, until thickened. Pour over Brussels sprouts and serve.